The unit itself was tossed out years ago (probably by my parents when I was young and still living with them; I don’t even remember what it looked like), but somehow I ended up keeping all the pieces. When I cleaned out my baking supply cabinet, I found them. I’d forgotten all about them. Who remembers the Easy Bake Oven? I’m sure many of you do. While the one you had might have looked different from the one I had in the 1970s, the fact remains that they all pretty much worked the same—and they all probably defined our adult attitudes toward baking. My mother loved to bake, and she was good at it. 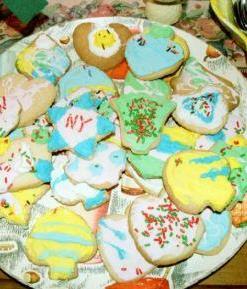 Although she baked many cookies, she was most creative with cakes. 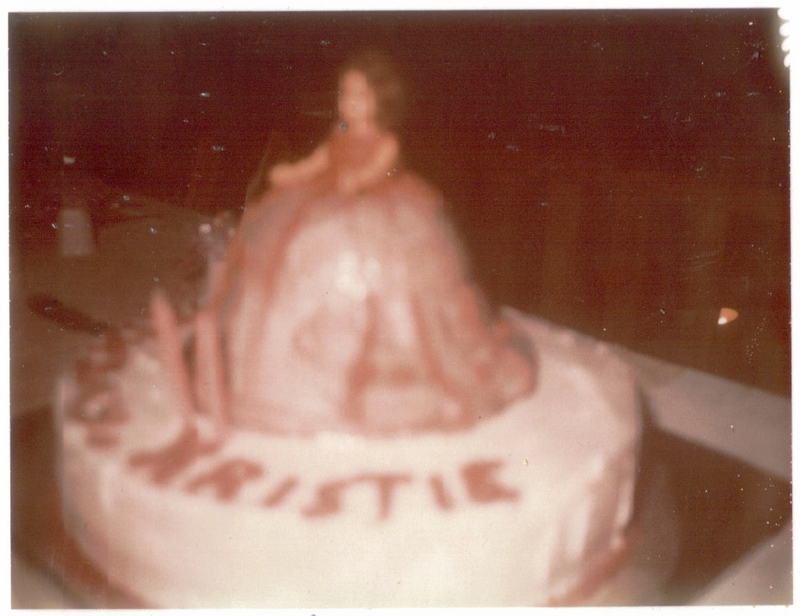 February, 1973: The cake my mother baked for my 2nd birthday. 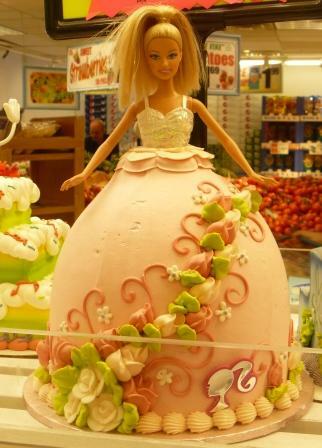 A Barbie Cake at my local ShopRite, June 2011. While the design for this type/style of cake with the doll in the middle was probably available in some how-to book way back in the 1970s or even earlier, I don’t recall seeing this type of cake available for orders at grocery store bakeries before the last five years or so. Please comment if you know anything about this type of cake or its history. 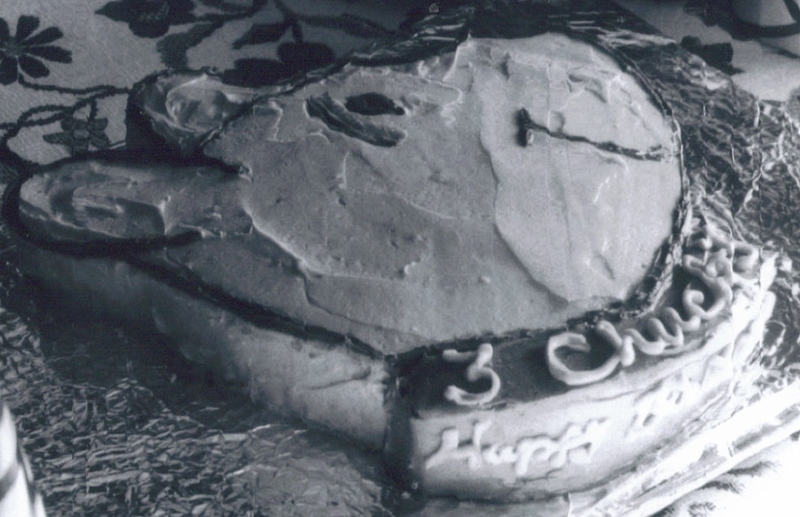 The Pooh cake my mother made for my brother Chuck’s 3rd birthday, March, 1977. She loved to bake Disney character cakes, mostly because that was what we were into at the time. I wish I had a photo of The Rescuers cake she baked for me one year, but I’ve sifted through all the family photos and haven’t found one. 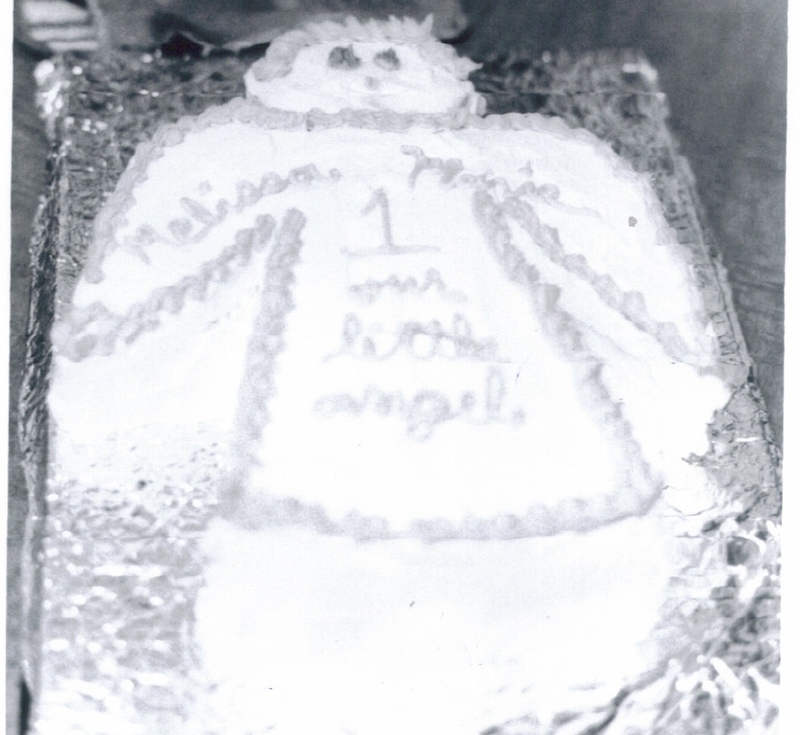 The angel cake my mother made for my sister Missie’s 1st birthday, March, 1977. 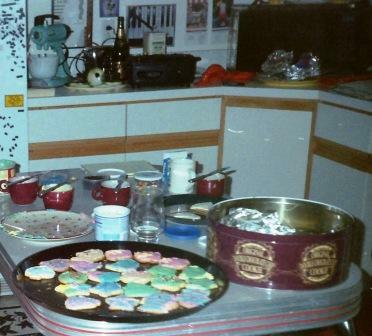 Mom was always baking—when it wasn’t cakes for our birthdays, it was cakes for her friends’ baby showers, weddings (yes, really), and parties; when it wasn’t cakes, it was cookies, especially for Christmas. She’d start at the end of October and bake, literally, day and night—sometimes I’d get up to go to school and it was clear she had been up all night—which was probably something she considered “normal,” since her mother did the same thing (my cousin Maryanne and I swore Grandma had elves helping her, because there were thousands of cookies but never a mess. We also swore she could have robbed banks and gotten away with it, because she didn’t have fingerprints due to the fact she never used oven mitts to pull the baking pans from the oven). I was always Mom’s dutiful assistant, although I have to admit most of the time it was because I’d wait for her to answer the phone and then shove a glob of uneaten dough in my mouth. She used to tell me my intestines would turn to jelly if I kept doing it, but I’m 40 and as far as I know have not yet developed symptoms of any such thing. When she considered me old enough (four years old), she bought me an Easy Bake Oven. At first, I loved eating the powder for the cake mixes more than I did baking them—the taste was so distinctly vanilla-malt, like a cheaper version of Ovaltine. 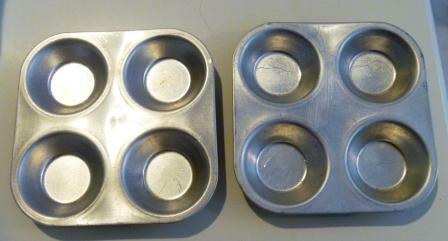 But soon I was making tiny little cakes on my own. 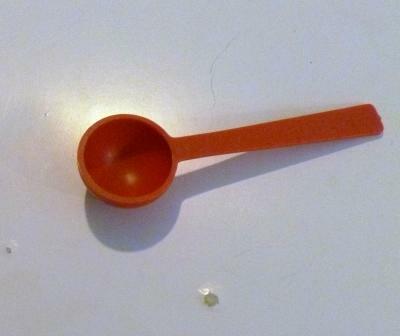 I was fascinated with the tiny red bowl and how the powder would turn to batter when I added water. And I was fascinated with sliding the pan full of batter in one side, and when it came out the other, I had a cake. Just like Mom’s big oven! I don’t know how many years I used the Easy Bake, because by the time I was ten, I was baking on my own for real, making cupcakes and cookies and cakes that usually didn’t make it past my family’s kitchen. Soon I graduated to making biscuits to go with beef stew, bread, and pizza dough—and even pies, because every October we had to do something with all those apples we picked at our local orchard. In 1986, my mother passed away, and so the baking of my siblings’ birthday cakes officially passed to me. 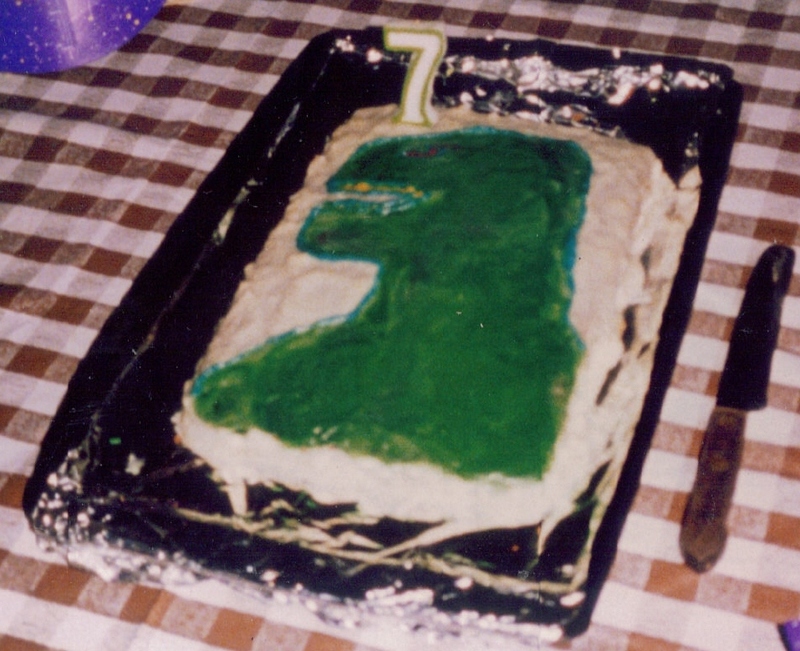 The cake I baked for my brother Chip for his 7th birthday, July 6, 1986. I couldn’t figure out how to do a cut-out of Godzilla, but I think I did a pretty good job with the frosting. 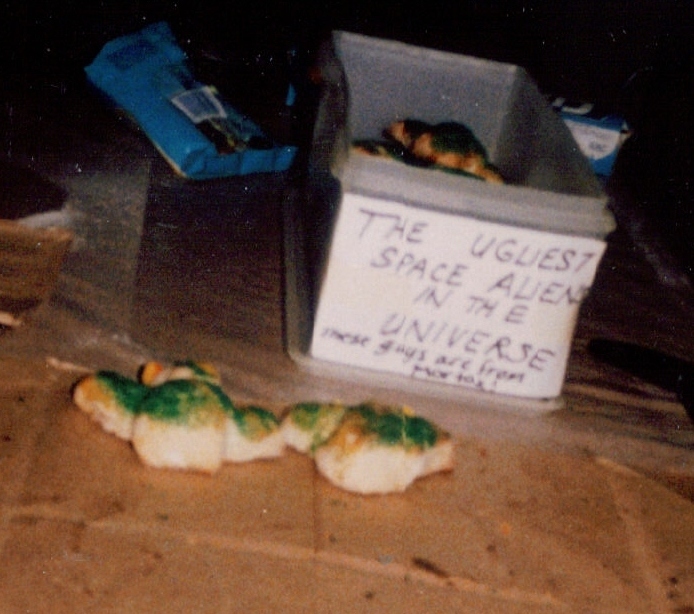 I baked these cookies for my friend Susie’s Halloween party in October, 1988. I couldn’t figure out why they came out like huge, soft biscuits instead of sugar cookies. Then I realized I’d been so excited about the party I hadn’t been focused on what I was doing—and used baking powder instead of baking soda. Ooops. My friends ate them anyway. I don’t do cakes anymore, but I still love to bake cookies. I’ll bake for just about anyone for any reason, in fact. 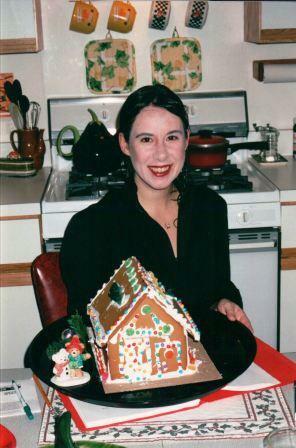 1997 was the first Christmas in Charles’ house, and the first time in many years I had a huge kitchen in which to create. 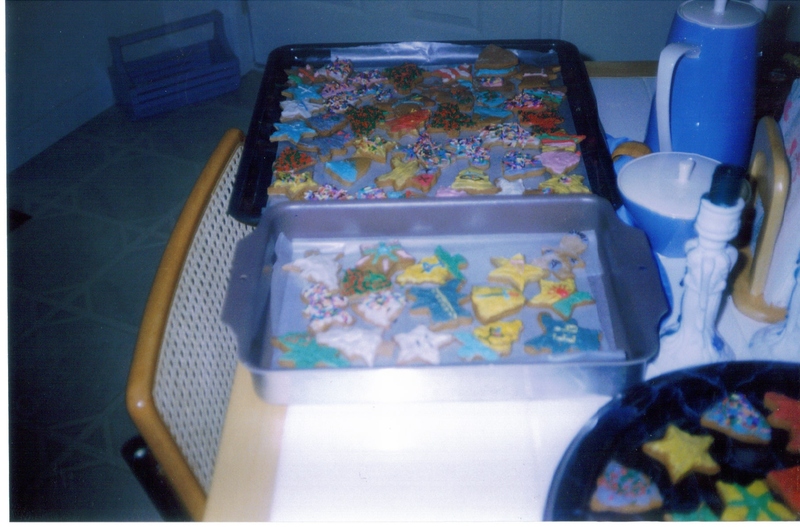 These were my Christmas cookies that year. 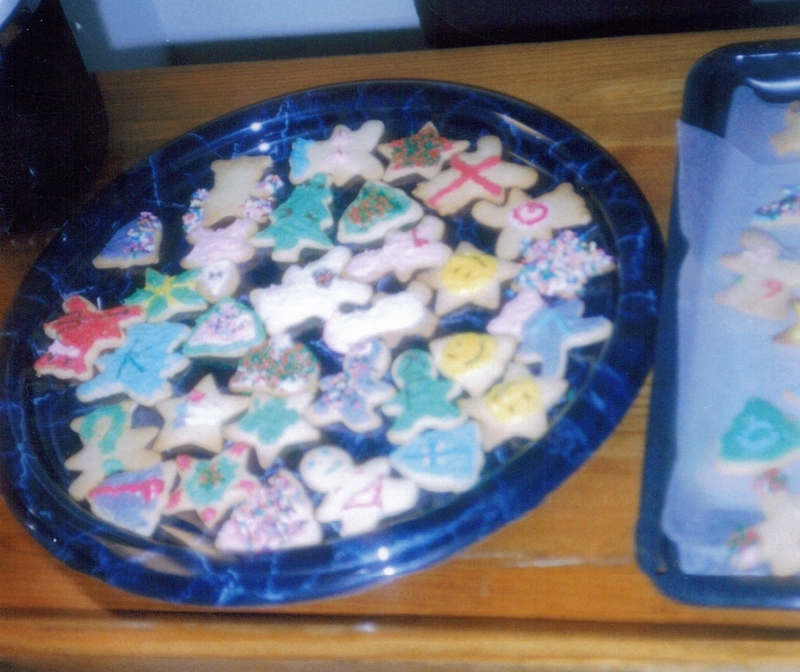 A shot of more of 1997’s cookies. Charles and my friend Manzino helped me frost them. In fact, frosting parties would become a Christmas tradition. They were a lot of fun! I bake for other holidays as well, but my favorite time of year to bake is the dead of February—usually when I’m snowed in. I bake Valentine’s Day cookies. Sort of. As you can see, I loved this book so much it became part of my household décor. Here it is on the mantel of our fireplace, where it lived for many years. 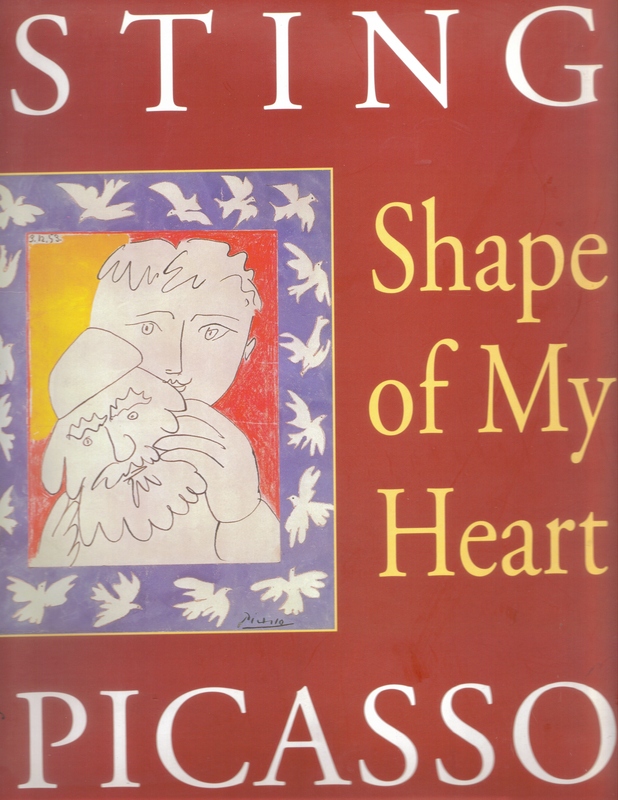 It was this book that inspired what everyone calls the Shape Of My Heart Cookies. 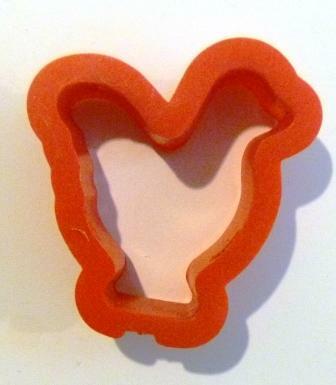 My mother had many cookie cutters, and one set she had that I always found rather curious was the four suits from a deck of cards—I don’t ever remember her using them, and I, up until that point, hadn’t ever thought of an occasion to use them either. 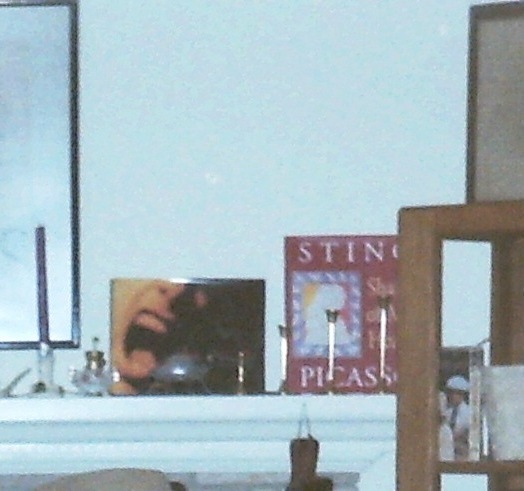 I’d been a fan of the Sting song for several years at that point, and on one snowy afternoon a week or so after I got the book, I retrieved my Ten Summoner’s Tales cassette (it was 1999) and listened to the song as I flipped through the pages. …I find a diamond, heart, spade, and club, and remember that my mother used to call the clubs “puppy feet,” and I used to berate her for not looking at the reality of what they were: clubs, which a person uses to beat another. Another glimmering view of her now: puppy feet. 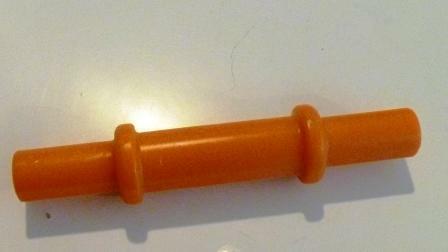 She wanted to take a weapon of war and make it into something harmless. …time to frost. I make butter-crème frosting, flavor the white ones (clubs, spades) with almond, and then there is no red food coloring for the red, and I dip into my memory and recall maraschino cherry juice would do nicely as well as give it flavor. And I frost the hearts and diamonds with a thick layer of pink, and now the hearts that were broken are harder to tell apart from the ones that were not. 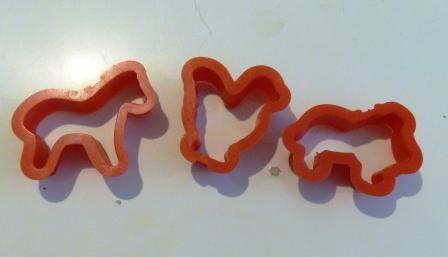 This is that very first 1999 batch of Shape Of My Heart Cookies. 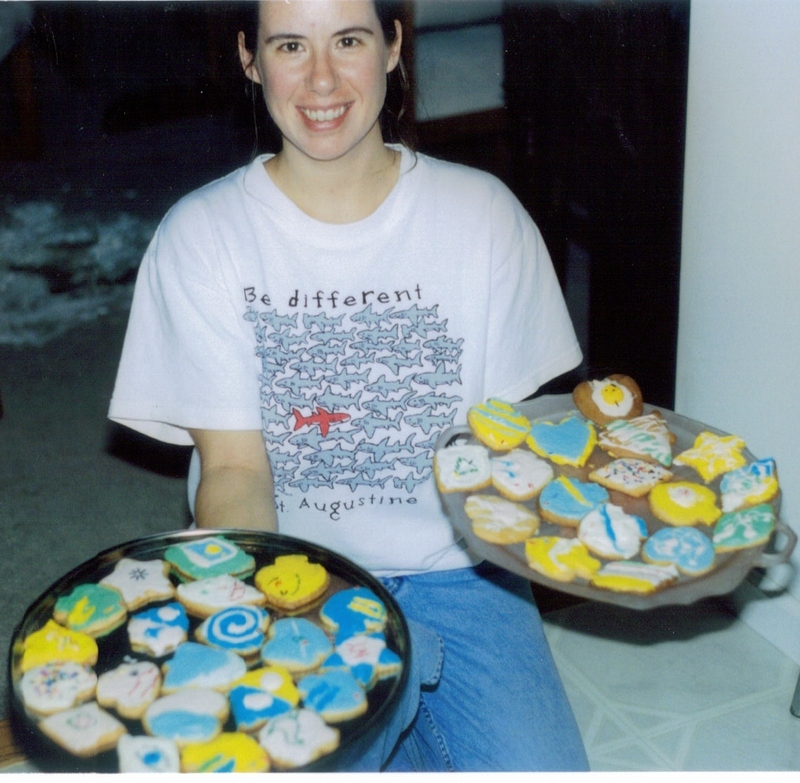 December, 2000: I threw a baking party that year. Several people came by to help us bake and frost. The wine was flowing, so I’m pretty sure we didn’t get as much done as we wanted to! 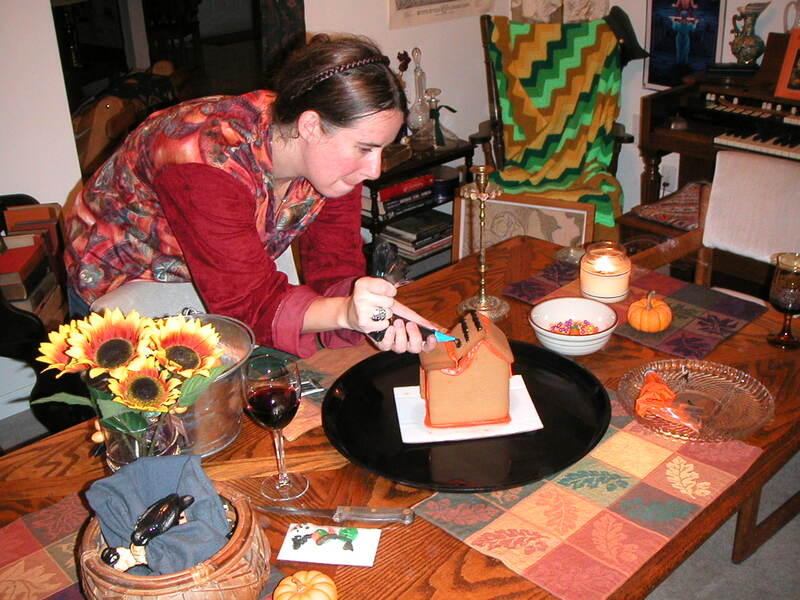 In 2001, I discovered those everything-in-a-box decorate your own gingerbread house kits. I had always wanted to make my own from scratch, and thought it would be good to get some practice actually putting one together to see if I enjoyed the process first. I did, but not enough to really go beyond the kit. This photo was taken December 9, 2001. 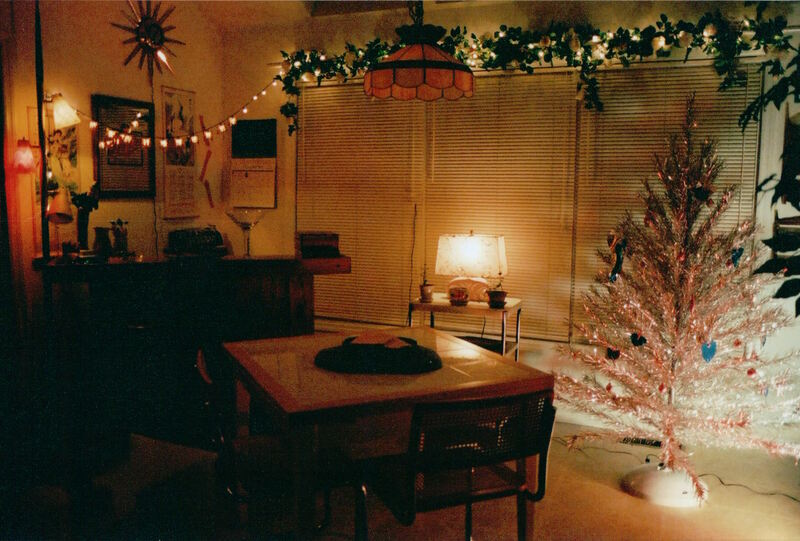 2001 was also the first year we threw “A Christmas Cocktail,” a 1960’s-themed Christmas party (yes, complete with a vintage silver aluminum tree and the color wheel). 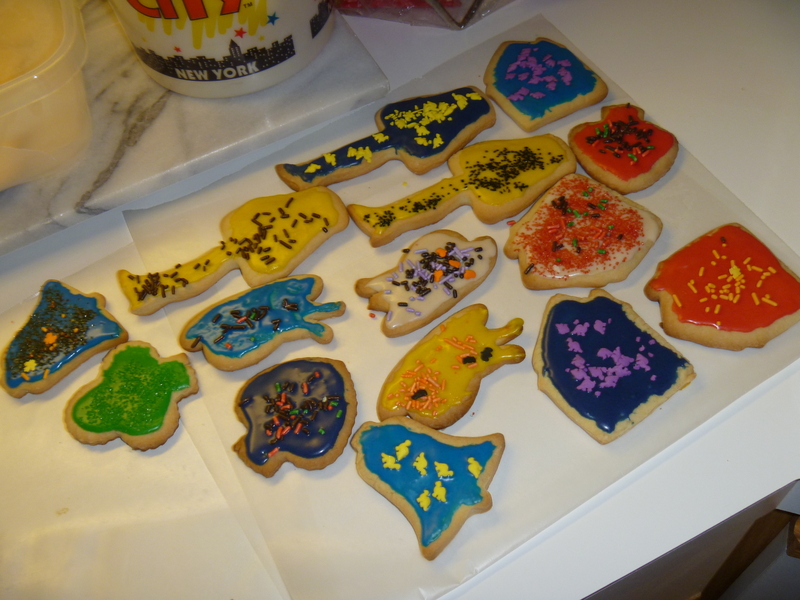 I baked a LOT of cookies for that party. 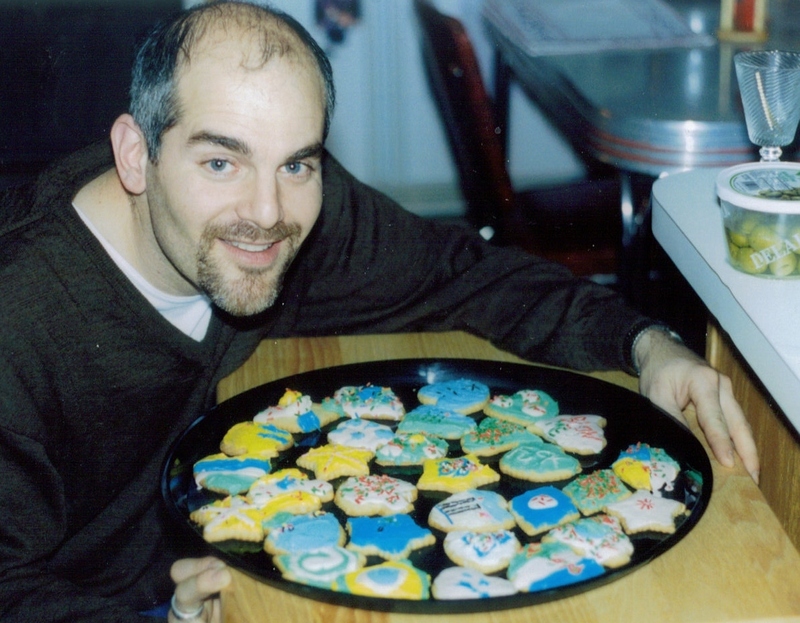 My friend Manzino (pictured below) came over to help me frost all the cookies for the party. Our aluminum tree with the color wheel. The cookies were on a table right near it during the party. The plate of cookies as it appeared the night of our first “A Christmas Cocktail” party, December 1, 2001. Baking is a favorite activity year-round. Here’s what I was working on one afternoon in January, 2002. That was also the year I learned how to make candy penguins. They didn’t come out so well, but maybe in the future I’ll have time to try it again. The only reason I started baking every Halloween was because someone bought me a bunch of Halloween cake/cookie decorations as a gift. 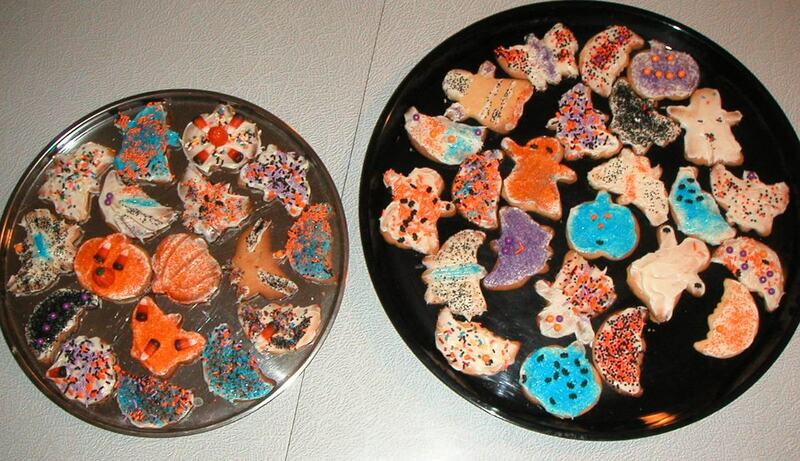 Here’s the first batch of Halloween cookies I made in 2002. When I discovered they had gingerbread house kits for Halloween, I couldn’t resist—in case you didn’t know already, Halloween—or “Poe Season” as I refer to it—is my favorite time of year. Here’s me at work in 2002. Thanksgiving weekend, 2010: Christmas Cookies. 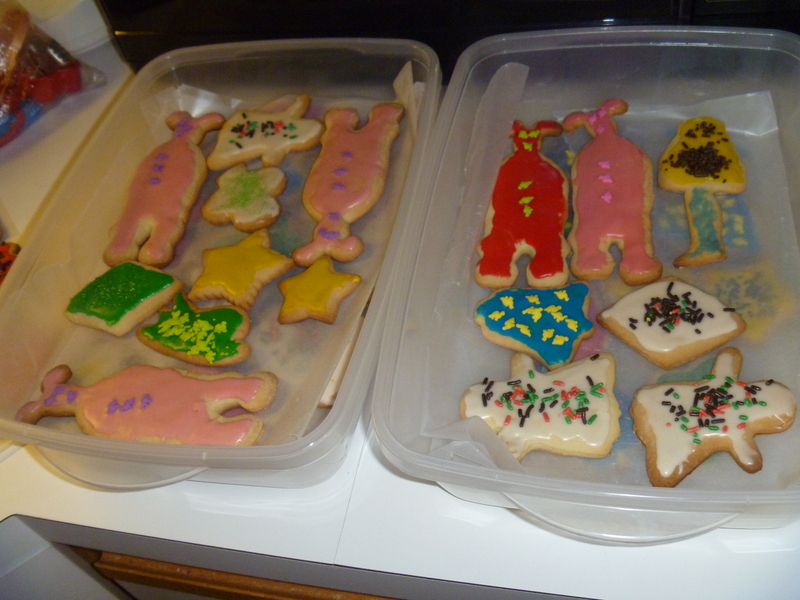 Yes, those are shapes inspired by the movie A Christmas Story. A set of them came in a DVD gift collection. They’re fun to give—especially the leg lamps—but as a baker, I can tell you a marketing person and NOT a baker designed the cutters. They’re flimsy, stick to the dough even when floured, and have way too many small extensions in the shape that make it nearly impossible to get it out in one piece. 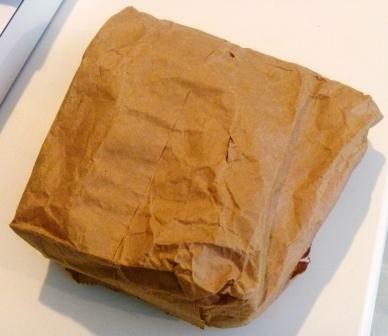 The paper lunch sack in which the items were stored. I kept them in the corner cabinet with all of my other baking goods. 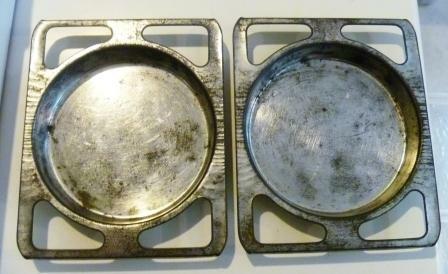 The baking pans for cakes. 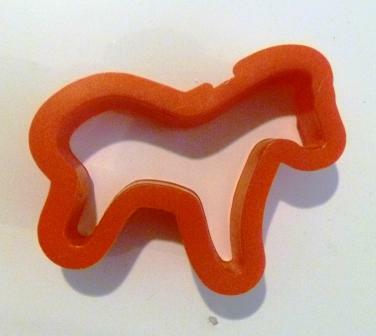 Farm animal cookie cutters. I only had three in the bag; I don’t know how many the set came with. Three doesn’t make sense to me—it seems like there would be four, but maybe not. If anyone knows, please drop me a line! 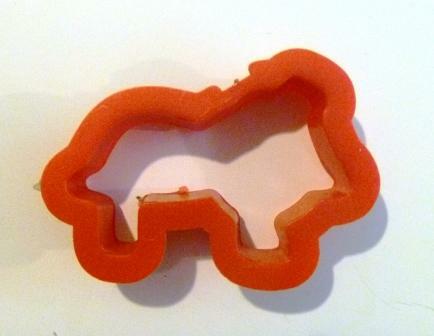 Cookie Cutter #1: I’m not sure, but I think this is a pig. 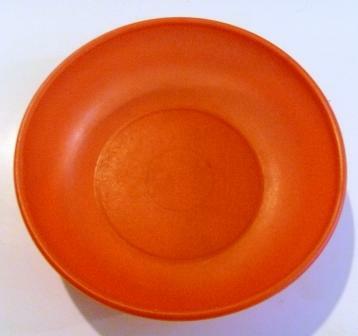 My favorite piece: the mixing bowl. 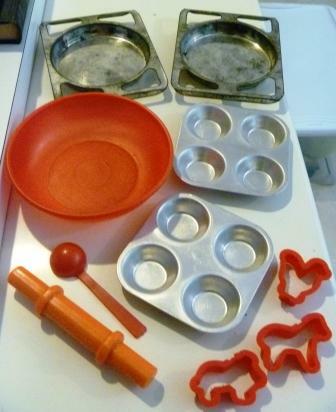 Hasbro has a neat little write-up on the Easy-Bake’s History:http://www.hasbro.com/easy-bake/en_US/loader.cfm?csModule=security/getfile&pageid=1803 The oven was also adopted into the National Toy Hall of Fame in 2006: http://www.toyhalloffame.org/toys/easy-bake-oven — ironically, the same year that Hasbro, the company that now makes the ovens, had to issue a recall due to risk of burnt fingers (just Google “Easy Bake Oven 2006,” there are tons of articles on the subject). Posted on July 8, 2011, in The Goodbye Project and tagged Baking Christmas Cookies, Clearing Clutter, Easy Bake Oven, Feng Shui, Gingerbread Houses, Goodwill, Hoarders A&E, Hoarding, How to Get Rid of your Junk, National Toy Hall of Fame, Pack Rat. Bookmark the permalink. Leave a comment.